It’s that time of year. The tomato plants are flowering. There may even be ripening tomatoes on your plants. Then one day you go out to pick a fresh, ripe, red, and what you hope to be juicy tomato only to find it’s flesh scarred with bites. There are small droppings on the leaves that look like dark soil. You have tomato hornworms. “But I don’t see any worms”, you say. Look closer. 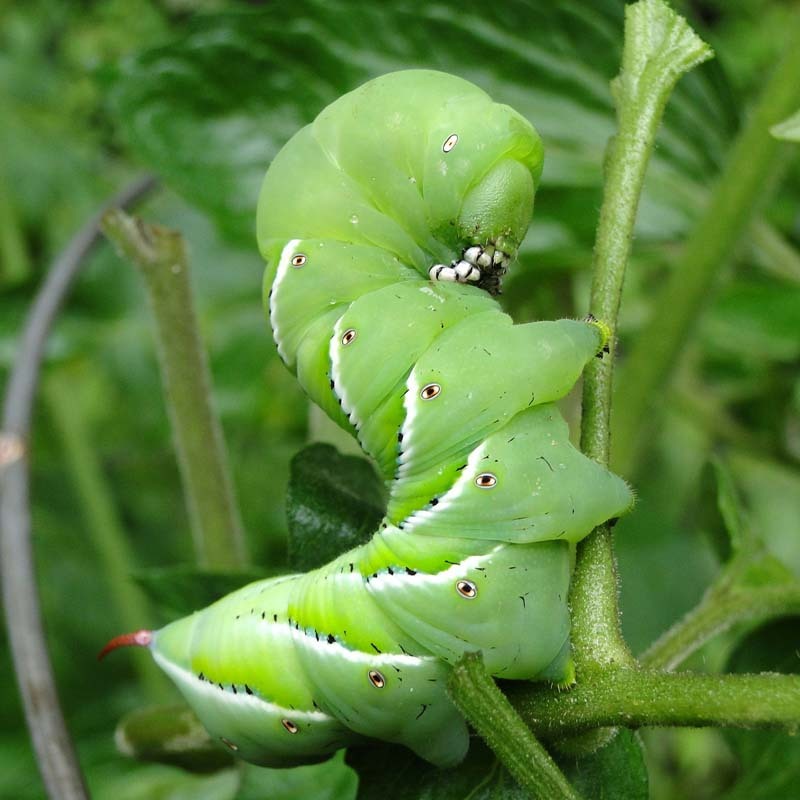 The tomato hornworm is a light green worm that is nearly the exact same color as tomato foliage. They are so well camouflaged that I can spot one, look away, and have trouble finding it again. They feed on tomato leaves, stems, and fruit; and can grow up to four of more inches long. They are completely disgusting and yet fascinating at the same time. In case you were wondering, you don’t want tomato hornworms in your garden. It’s best to hand pick and dispose of them. This is a job I leave to my 5 and 6 year old boys. However there are many insects that feed on the worms. One in particular is the braconid wasp. If you see tiny white rice like spots on the tomato hornworm, it is best to leave it in the garden or in an open top jar. Larva will hatch from the eggs and feed on the inside of the worm killing it. New wasps will then fly to your garden to find other hornworms to feed on. Thus completing the circle of life. Isn’t it amazing? Previous Post: « What to do with Woodchucks? The only surefire thing I’ve found in depleting horn worm populations is hand picking and killing or leaving out on a tray for the birds to come by and enjoy. these beasties also enjoy my pepper plants. last season i used chemicals to kill them but then got an infestation of spider mites due to the chemical. i am trying to find a way to zap these things naturally. can anybody out there help me?